We wanted to provide visitors to allencell.org an entry point to explore the data and research we produce at the Allen Institute for Cell Science. 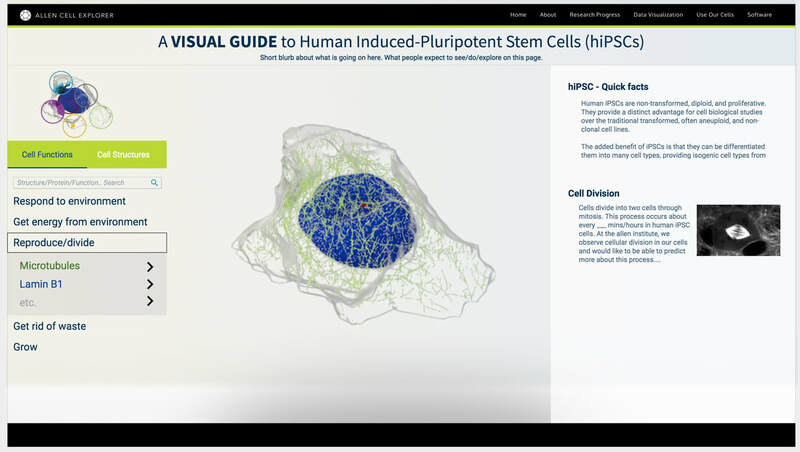 ​The Visual Guide to Human Cells web page organizes information about human induced pluripotent stem cells into a curated collection of interactive models. You can rotate and zoom into 3D cells, each segmented from real data for each phase of mitosis, while learning more about individual cell structures and functions. To create the 3D assets we wrote a Cinema4D script to create .obj and texture files. Read about it in detail here.